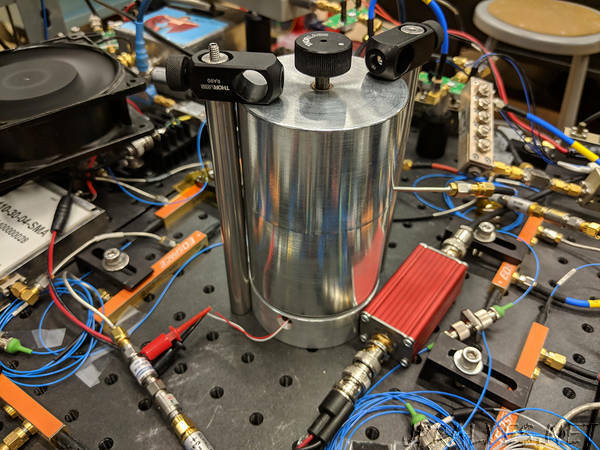 “Physicists at the National Institute of Standards and Technology (NIST) have used common electronics to build a laser that pulses 100 times more often than conventional ultrafast lasers. The advance could extend the benefits of ultrafast science to new applications such as imaging of biological materials in real time. The technology for making electro-optic lasers has been around for five decades, and the idea seems alluringly simple. But until now researchers have been unable to electronically switch light to make ultrafast pulses and eliminate electronic noise, or interference. As described in the Sept. 28 issue of Science, NIST scientists developed a filtering method to reduce the heat-induced interference that otherwise would ruin the consistency of electronically synthesized light. The conventional source of ultrafast light is an optical frequency comb, a precise “ruler” for light. Combs are usually made with sophisticated “mode-locked” lasers, which form pulses from many different colors of light waves that overlap, creating links between optical and microwave frequencies. Interoperation of optical and microwave signals powers the latest advances in communications, timekeepingand quantum sensing systems. In contrast, NIST’s new electro-optic laser imposes microwave electronic vibrations on a continuous-wave laser operating at optical frequencies, effectively carving pulses into the light.